Engraved on the winner’s trophy of the legendary Circuit of Ireland Rally is a name synonymous with Irish rallying and is joined by names such as Roger Clark, Colin McRae and World Rally Championship driver Juho Hanninen; and that name is Eugene Donnelly. 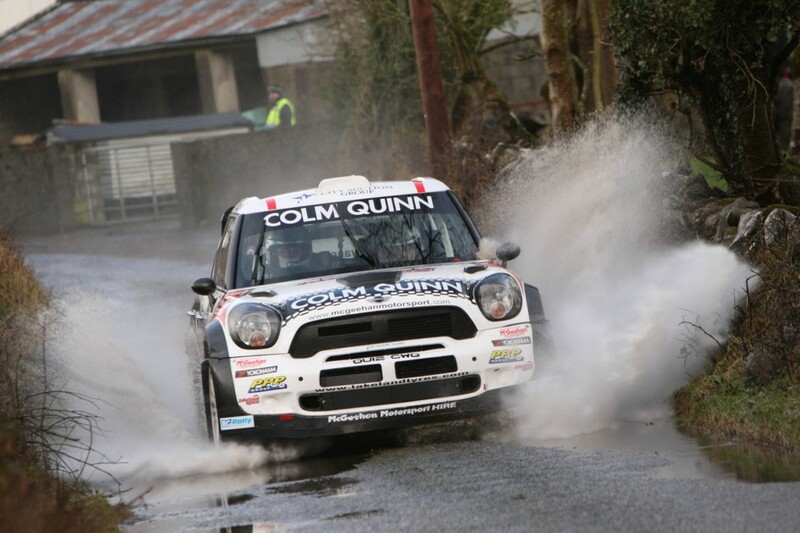 The five times Irish Tarmac Champion had a glint in his eye this week as he placed a last minute entry into the Circuit in a McGeehan Motorsport Prodrive John Cooper Works MINI WRC, in an attempt to scribe his name under his 2006 & 2009 victories on the event. The Circuit of Ireland provides a fantastic backdrop for Donnelly to showcase the MINI across Ireland and once again secured the backing of leading Athlone based MINI dealer Colm Quinn. “I can’t thank Colm Quinn enough for their continued support which brings this iconic event together with such an equally iconic car as the MINI” says Donnelly. “It will be such an exciting event for all the rally fans and supporter’s right across the country and it will offer a great opportunity for our backers to reach tens of thousands of followers throughout the event”. Joining the Midlands based dealership is the continued support from Lakeland Tyres, Protune, Belfast City Auctions, PPP Salvage and Mc Partland Fuels. A new partnership with Donnelly Motorsport is mobile welfare facility manufacturer MT-Limpet from Armagh which is a welcome addition to the team for the Circuit. Alongside parent company MT-Waste, the company is taking the opportunity to show its latest mobile welfare unit at the service park in Belfast during the event. Sean McArdle, director of MT-Waste commented “We are delighted to be involved with Donnelly Motorsport for the 2014 Circuit of Ireland and we would like to wish Eugene & Paul a safe & enjoyable rally in the MINI. We all hope they will be spraying our Limpet unit with champagne on Saturday afternoon”. “It’s fantastic to have such great support from all our sponsors and we are delighted they can join us on this world famous event” continues No.4 seed Donnelly. “It will be a fabulous atmosphere right from the ceremonial start on Thursday to the finish ramp on Saturday evening and we are looking forward to a great battle on some of the stages in the country”. The 17-19 April event is the second round of the 2014 Clonakilty Blackpudding Irish Tarmac Rally Championship and offers over 143 competitive stage miles, spread across Northern and Southern Ireland. Based at the historic Belfast Titanic Quarter, the event kicks off with a ceremonial start in Belfast city on Thursday night. This is followed by two days of tough competition, culminating in the finish celebrations back in Belfast on Saturday evening.